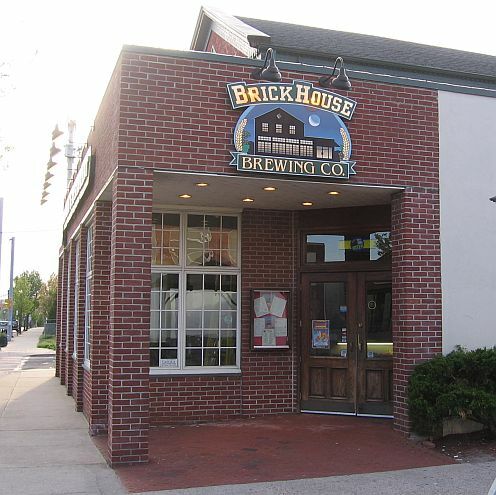 The BrickHouse Brewery -- A review unexpected, but good. The powers that be had me eating dinner at the BrickHouse Brewery recently, and on their 14th birthday, too! There was some live music, some cold beer, and a packed bar. Not expecting to see a band, we decided to eat first before watching the band from the bar. The music was quite loud and the bar was just loaded with people. The inside dining area was nearly filled, too, and the music could easily be heard there so our hostess gave us the option to sit outside for dinner. Not one to give up an outdoor eating opportunity, I agreed and we were seated outside, in their “Hops Garden.” I was happy to see that this wasn't just a name and that there were hops actually growing out there. Despite the large crowd inside, the garden was nearly empty. Thankfully, we were still well tended to and it let us have our meal in a quiet location. The menu had a wide range of meals to choose from, and honestly was more varied than I had expected. A place called the “BrickHouse Brewery” doesn't exactly conjure up the thought of a big plate of pasta, but there on the menu are nine or so pasta dishes. We decided on an appetizer of onion rings and started with a couple beers. Our “Boys Red” and “Street Light” beers came soon after followed by a plate of onion rings. The onion rings, while good, weren't spectacular. The sauce they came with, on the other hand, was amazing. It was a Cajun cream sauce and, given the chance, I'd dip anything in it. I'd put it on every sandwich. I'd mix it in my coffee. It's that good. The “Boys Red” is their award winning red beer and I have to say that it's a deserved award. It's the kind of beer that you want with a meal, so it fit perfectly at my table. The “Street Light” is for those who would normally order a Bud Light. This is not to say that it tastes anything like Bud Light, but it's the closest alternative. “Drinkability” is the name of the game with this one. You'll see the big shots talk about “drinkability” of their beers. While this normally boils down to “we put more water in it” such is not the case with the “Street Light” beer. Very easy to drink for those who avoid the more bitter beers, but still plenty of flavor to make it worthy of the BrickHouse Brewery beer menu. I wish I didn't have to drive home, or I would have took a crack at their six-beer sampler. The glasses are smaller for the sampler, but you still get a good amount in each. I also enjoyed seeing beers from the Blue Point Brewery on the menu, as I'm always one to support the locals. When it came time to order our meals I decided to go with a twist on a classic: the “Tex Mex.” This sandwich is essentially a French dip, but instead comes with cheddar and jalapeños. This sounds like a better idea than it is, to be honest. Jalapeños and gravy don't mix as well as I figured. This isn't to say that it was a bad sandwich, though. It was well put together and tasted great, I just didn't dip my sandwich as much as I would have normally. For a side I picked their garlic mashed potatoes. Let me add that choosing a side at the BrickHouse Brewery is a massive undertaking in itself. Choosing mine took longer than my entrée! There are just so many choices for sides (totaling around seventeen) it's almost information overload. My dining partner ordered the “Street Light Chicken” sandwich with “BrickHouse fries” which are just like steak fries. Three of those seventeen side dishes I mentioned are actually fries. You've got BrickHouse fries, shoestring fries, and sweet potato fries which come with a sweet sauce for dipping. Those sweet potato fries were a close second for my side choice. I just couldn't pass up the chance to pour my Tex Mex's gravy over some mashed potatoes. After finishing our meals and beer (and, of course, sitting back for a moment to enjoy the hops garden on a full stomach) we ventured back inside to listen to some music. Normally, BrickHouse has live music after 8 PM, so we weren't really expecting this, but I'm glad we caught it. The bar was packed with people watching and clapping along to the folk rock band that was playing. It seems that BrickHouse Brewery is definitely more of a musical venue than just some bar/restaurant. Nearly every night they have something going on from movie nights on Tuesday, to open jam nights on Sunday. Patchogue is a little far from my place in Mineola, but if I'm in the area I'd love to stop by again and try the rest of their beer, grab a growler of “Boys Red” for home, and bug the chef for the recipe to their Cajun cream sauce. Alternatively, if they decide to show “Star Wars” for a Tuesday movie night and I'll come running, plastic lightsaber in hand. Return to the main BrickHouse Brewery page.